← Picture of the Week – Iris inside NCMA! Donatos Pizza Comes To Raleigh! Donatos is a regional pizza chain that started out of the Ohio area back in the early 1960’s and recently opened it’s first location in North Carolina in downtown Raleigh’s Seaboard Shopping Center just across the street from Peace College. This happens to be right across the street from where I work and I am a big pizza fan so of course I had to stop by and check it out! 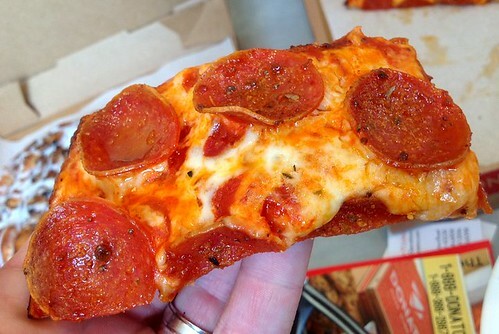 Donatos Thin Crust Edge-To-Edge Pepperoni Pizza! 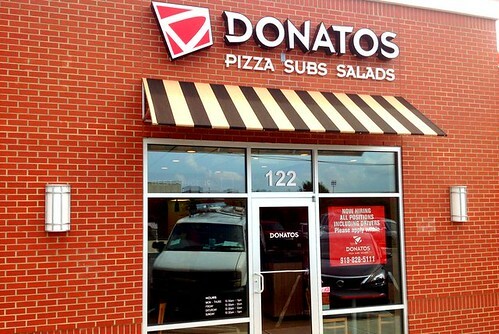 Dontatos is known for its “edge to edge” toppings covering almost every square inch of the surface of the pizza. The manager at the Raleigh location told me there’s more than 100 slices of pepperoni on their large pepperoni pizza. I didn’t count them all on my pie, but let’s just say there were a lot! I was pretty hungry the day I visited so I wasn’t shy and dove right in to see what their pizza is all about. I was fairly impressed with the pizza. They have both hand tossed and thin crust pizzas with just about every topping you can think of. I went for their classic thin crust pepperoni. It had a great balance of cheese, and a flavorful sauce layered over the thin and crispy crust. 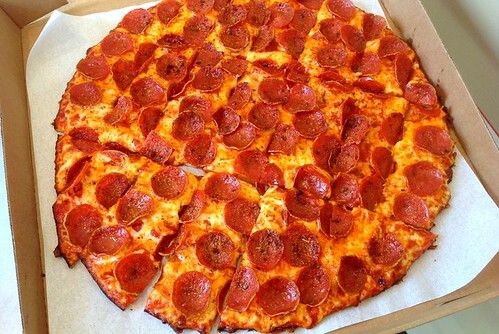 Of course each slice had a nice serving of pepperoni as well. I was a happy camper and did some serious damage to the pie before I threw in the towel and boxed the rest to take home with me. They also offer salads, wings, and oven baked subs. You can view their full menu here. 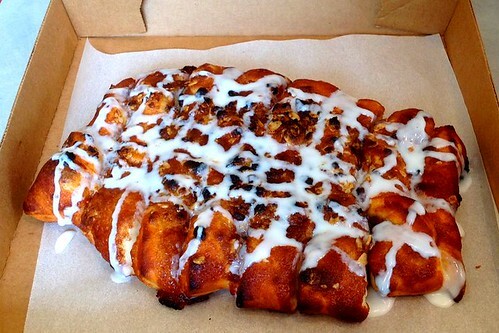 I have a bit of a sweet tooth so I also had an order of their cinnamon twists that are baked right there in the shop and topped with cinnamon sugar and drizzled with warm icing. Before you ask – I did not eat all of this myself. I did consume a “healthy portion” of cinnamon twists but had plenty leftover to bring home to share! 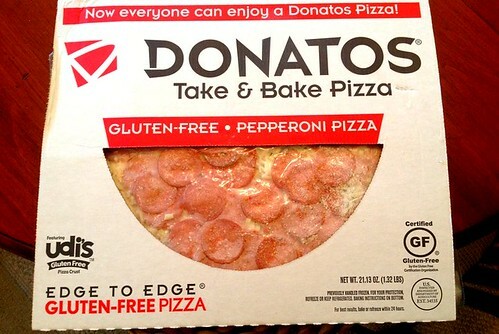 I was also happy to see that Donatos offers a take-n-bake Gluten Free option for their pizza. It uses the gluten free crust from Udi’s and you can take the pizza home to bake in your own oven. I don’t have a gluten allergy, but I know people who do and I appreciate places that try to find ways to work with their dietary concerns. All in all I was very pleased with my first visit to Donatos and wouldn’t hesitate recommending them to somebody looking for a solid pizza. I look forward to heading back and trying some of their baked subs on my next visit. The location in Raleigh is more of a pick-up spot than a dine in location but they do have a few tables and you can eat there in a pinch.They also offer delivery, pick-up, and catering services. For more information check out their website here. Do they do slices for lunch? Huge opportunity with Peace there and Broughton nearby. Art, I’m not sure about slices. My first impression is no, but I will stop by and check this week to confirm. I agree there is potential for a huge opportunity there!